Plaintiff's motion for a preliminary injunction for infringement of its piston patents was denied because plaintiff did not establish a likelihood of success on the merits and there was uncertainty following the Federal Circuit's recent vacating of Akamai. "It is true that under current principles, [defendant] cannot escape liability simply by outsourcing the infringing steps, but [plaintiff] still needs to show that [defendant] controls or directs the actions of [a third party manufacturer] in friction welding its pistons. And given the first opinion, now vacated, in [Akamai Technologies, Inc. v. MIT, Nos. 2009-1372, 2009-1380, 2009-1416, 2009-1417 (Fed. Cir. Apr. 20, 2011)], its burden may even turn out to be heavier, requiring a showing of an agency relationship. . . . [T]he evidence in the record to date, if believed by a jury, could allow [defendant] to establish by clear and convincing evidence at trial that it cannot be held liable for infringement of the [patent] because of its lack of dominion and control over every step of the patented method (and/or because it does not maintain a relationship with [the third party] wherein [defendant] acts as the Company’s principal)." Since we began publishing the Docket Report in 2008, many of our customers (and a few competitors) have asked how we create the Docket Report and populate the Docket Navigator research database. The answer involves the same formula many of our customers employ to win cases: a bit of ingenuity, a lot of hard work, and a propensity to sweat the details. Today's short video provides a behind-the-scenes look at how the Docket Navigator team processes patent litigation information one day at a time. As you watch the video, keep in mind that our team of patent attorneys and paralegals collectively spend between 20 and 26 hours curating patent litigation data for a single day. Not only does this ensure the integrity of our data, but it also means that you're only looking at the things a patent litigator would want to see, labeled with terms that you'll find valuable. Yes, that is a lot of work and much of it is tedious. But the result is a rich dataset that allows you to pinpoint exactly the information you need quickly and without the guesswork inherent in other research tools. Thanks to everyone who submitted a correct answer for our Scavenger Hunt this week. More than 70 attorneys found the correct answer with the powerful Docket Navigator patent litigation research database. Congratulations to Jeff Andrews of Locke Lord for winning the iPad2®. We will be hosting another Scavenger Hunt next month so be sure to ask for a free password to Docket Navigator so you'll be ready to search! The court sua sponte dismissed plaintiff's qui tam false marking action for failure to state a claim following the enactment of the Leahy-Smith America Invents Act. "This dismissal is without prejudice for Plaintiff to re-file its complaint in the event Plaintiff can prove it has suffered a 'competitive injury' and it can satisfy the other requirements under the statute." Docket Navigator Scavenger Hunt – Round 3! This week’s Scavenger Hunt is a bit more involved than previous weeks’ questions. It contains two parts and two chances to win. You will receive one chance to win for each portion of the question you answer correctly. Correct answers can be submitted to win a guaranteed prize (2GB USB thumb drive) and a chance to win an even bigger prize (an iPad2®)! In 2003, IP Innovation, LLC initiated a patent case that was assigned to Hon. Charles Kocoras. In that case, Judge Kocoras construed the terms of two patents. The patent with the higher number contained a term consisting of a single word. What construction did the court give that term? That same patent was declared unenforceable a few years later. What is the name of the judge who declared the patent unenforceable? Ask for a free password to Docket Navigator. * iPad is a trademark of Apple, Inc., registered in the U.S. and other countries. Apple, Inc. does not endorse or sponsor Docket Navigator or its products or services. The text of Judge Rader's speech, the Committee's Report and E-Discovery Model Order are distributed with authorization of Edward Reines, Chair of the Federal Circuit Advisory Council. The court granted defendant's motion in limine to exclude the testimony of plaintiff's damages expert concerning a royalty range. "[The expert's] testimony on a royalty range was not limited to trocars, but appears to be based on his experience on the medical field as a whole. Prior license agreements must be 'sufficiently comparable to the hypothetical license at issue in suit.' . . . The court understands Plaintiffs’ argument about relevance under Georgia-Pacific factor 12, but both factor 12 and [Uniloc USA, Inc. v. Microsoft Corp., 632 F.3d 1292 (Fed. Cir. 2011)] discuss royalty rates for use of the invention and similar inventions. [Plaintiff's expert's] testimony involved the medical field in general, and devices not comparable to the trocars at issue in this case." How many motions for enhanced damages or attorneys' fees have been filed in the California federal district courts? An award of enhanced damages or attorneys’ fees can significantly increase the stakes of a patent case. Like many other aspects of patent litigation, the questions of whether an award is appropriate and if so the amount are both entrusted to the discretion of the district court. Here again, knowing how a particular judge has ruled on the issue in past cases can help tailor a request for enhanced damages or opposition thereto. Docket Navigator was designed to track awards of enhanced damages and attorneys’ fees in several different ways. First, when a court rules on a motion for enhanced damages or attorneys’ fees, we flag that order by type of motion (e.g., order on “motion for enhanced damages/attorneys’ fees”). Second, we record the legal concepts addressed in the order. For example, in a motion for enhanced damages or attorneys’ fees, the court might address the issues of willfulness, trial misconduct, vexatious litigation, copying, etc. Once the court has determined that an award is appropriate, it sometimes requests a second round of briefing on the amount of fees or enhanced damages to award. Because this second round of briefing involves different legal concepts (e.g., reasonableness of hourly rate and hours billed), we record a different set of legal issues for this second step (e.g., “calculating attorneys’ fees”). Finally, we separately record any remedy including the type, the amount, the party against whom the remedy was awarded, and the recipient. Today’s Question of the Day asks for a simple count of motions and a break-down of those that were granted versus those that were denied. Watch the short video to see how we answered the question using Docket Navigator. The magistrate judge recommended denying defendants' motion to dismiss plaintiff's infringement claims on the ground that the asserted email processing patent was not drawn to eligible subject matter. "Here, the claims recite a method performed using a mail processing program. It is therefore a process within the definition of the Patent Act, and the question is whether it is so abstract to be ineligible. . . . [T]he use of the mail processing program to scan incoming messages, determine whether the messages are context-aware, and, if so, to retrieve the context information from one or more external locations will require programming. . . . [T]he software would not be so simple as to involve purely mental steps in which the computer’s use was merely incidental. . . . Bearing in mind that the Federal Circuit has narrowly construed the exclusion for purely mental steps, it is the undersigned’s view that the [patent-in-suit] claims eligible subject matter under 35 U.S.C. § 101." Has the admissibility of Brian Napper’s expert testimony been challenged? If so, has any challenge been successful? Patent litigation has often been referred to as a “battle of the experts,” meaning experts often play a central role in the outcome of the case. For this reason, it’s important to select experts whose qualifications and opinions will survive scrutiny by the opposition. At the same time, it’s equally important to evaluate your opponents’ experts’ qualifications and opinions to ensure they comply with the applicable rules of civil procedure and evidence as well as local rules. Docket Navigator can help in several ways. As we’ve seen from past Questions of the Day, Docket Navigator allows you to search for court orders involving specific legal issues (e.g., challenging the qualification of an expert, challenging the expert’s methodology, or challenging the data on which an expert’s testimony is based) by a specific judge. Conducting such a search provides insight on how your judge may rule on the admissibility of expert testimony in the future. Today’s Question of the Day addresses the question from a slightly different perspective — that of the individual expert witness. So instead of asking how a particular judge rules on expert witness issues, it asks whether the testimony of a particular expert has been challenged in past litigation and whether any such challenges have been successful. Watch this short video to see how we answered the question using Docket Navigator. The court granted plaintiff's motion to dismiss defendant's inequitable conduct counterclaim for failure to state a claim. "[Defendant] alleges that [plaintiff] misrepresented the necessity of obtaining the [patent-in-suit] as quickly as possible to terminate ongoing infringement at the time of application. [Defendant] then points to the time gap of roughly 18 months between receiving the patent and commencing litigation against [an alleged infringer] in a previous lawsuit, as evidence of [plaintiff's] lack of good faith. Using history as a guide, [defendant] infers that [plaintiff] is repeating its strategy of maximizing infringement damages by waiting five years before bringing the present suit. . . . The one alleged misrepresentation, that [plaintiff] asked the PTO to expedite its patent so it could sue, as plead, is not material to the claim of inequitable conduct as it relates to this case. This case arose well after that statement and the filing of the patent. The court does not find that statement material to this litigation. . . . Further, even when taken as true, there is no showing in the pleadings that there is any intent to deceive on the part of [plaintiff]." Which firms have been disqualified from representing a party in patent litigation? While it is interesting to compile a list of disqualified law firms, it is probably even more interesting to compile a list of disqualification orders reflecting judges’ varied approaches to disqualification. Disqualification is one of those issues that is uniquely in the discretion of the district court and effectively unreviewable on appeal. So knowing how a particular judge approaches the question of disqualification, and how that judge has ruled on the issue in the past, could be critical to success on a motion to disqualify. To see how we compiled a comprehensive list of disqualification orders and derived the list of disqualified firms, watch this short video. The court granted defendants' motion to dismiss for misjoinder and dismissed four of five defendants. "[P]laintiff asserts that each of the accused instrumentalities is comprised of, among other things, a processor and its associated cache memory, a PWM rate controller, and portions of the BIOS software. Plaintiff has grouped defendants’ products into “uniform, homogenous groupings” based upon the processor family utilized in the accused instrumentalities, and plaintiff asserts each of the processors in the same group performs its portion of the power management accused of infringement in exactly the same fashion. Thus, plaintiff asserts, there are multiple common legal and factual questions presented by plaintiff’s infringement claims against defendants . . . Although plaintiff accuses defendants of infringing the [same] Patent in five similar ways, plaintiff does not allege that defendants’ infringement involved the 'same transaction, occurrence or series of transactions or occurrences.' Plaintiff has not alleged that defendants acted in concert or otherwise controlled or directed each others’ conduct – and indeed defendants appear to be ardent competitors of one another in the marketplace for their products; nor has plaintiff alleged any connection between defendants except for the fact that each defendant is alleged to have infringed plaintiff’s patent." Thanks to everyone who submitted a correct answer for our Scavenger Hunt this week. 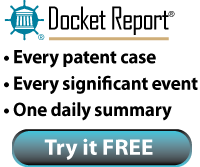 More than 60 attorneys found the correct answer with the powerful Docket Navigator patent litigation research database. Congratulations to Jim Lester of MacCord Mason for winning the iPad2®. We will be hosting another Scavenger Hunt next Wednesday, September 28, 2011 so be sure to ask for a free password to Docket Navigator so you'll be ready to search! Docket Navigator Scavenger Hunt – Round 2! Round 2 of the Docket Navigator scavenger hunt begins today! If you didn’t play last week, here’s how it works. We ask a Question of the Day, but instead of us giving you the answer, you get to FIND the answer using the Docket Navigator database. Correct answers can be submitted to win a guaranteed prize (2gb USB flash drive) and a chance to win an even bigger prize (an iPad2®)! Last week, we received only 38 correct entries. That means the people who submitted correct answers had a 1 in 38 chance of winning an iPad2. Not bad odds for a prize worth more than $500! So if you didn’t play last week, take a few minutes to submit an answer. You’ll learn how to use an amazing resource, win a guaranteed prize, and be entered for a chance to win an iPad2. Plus, you’ll have some fun along the way. Here's the catch: if you are going to participate in the scavenger hunt you have to play quickly. The deadline for submitting correct answers ends tonight at midnight. The drawing will be held tomorrow. It's a quick contest. On two occasions, Judge Claudia Wilken of the Northern District of California has granted motions to dismiss for lack of subject matter jurisdiction because the declaratory judgment plaintiffs failed to assert facts sufficient to establish a “substantial controversy” under MedImmune, Inc. v. Genentech, Inc., 549 U.S. 118 (2007). In both cases, the declaratory judgment plaintiffs claimed that the defendants’ lawsuits against certain third parties created a substantial controversy. What relationship did those third parties have with the declaratory judgment plaintiffs? The court granted defendants' motion to sever plaintiff's infringement claims despite plaintiff's argument that "[e]ach Defendant has a mapping software application that uses [plaintiff's] patented data compression format. . . . Each Defendant operates its infringing mapping application via smartphones. Each Defendant . . . obtains the same mapping data from the same geocoding source." "Other courts have found . . . that these kinds of allegations do not satisfy the 'same transaction' requirement. This Court finds the reasoning of those cases persuasive and on that basis, grants Defendants’ motions to sever." What is the shortest period of delay that a district has deemed sufficient to support a laches defense in recent decisions? In the past twelve months, district courts have addressed the issue of litigation laches fifteen times. Two of those instances did not rule on the merits of a laches defense, but addressed evidentiary and procedural issues — whether a motion in limine to exclude discussion of laches at trial, and whether a party could amend its pleading to include a laches defense. See how we identified these cases using Docket Navigator. The court granted defendant's motion for summary judgment that its portable computer patent was not invalid as indefinite. "[Plaintiff] argues '[c]laim 3 fails for indefiniteness and for lack of enablement and written description,' and that claim 9 fails similarly. [Plaintiff], however, has no apparent difficulty in understanding the term 'recharger' as used in its invalidity argument . . . Chargers/rechargers were as ubiquitous at the time of the [patent-in-suit] application as they are now, and the dictionary defines both as devices for charging storage batteries. Claim 3 is not indefinite merely because the recharger is only shown in a single figure, sans the recharger connector. '[A]n applicant is not required to describe in the specification every conceivable and possible future embodiment of his invention.'" How have district courts applied the prosecution laches defense in recent cases? Nine years ago the Federal Circuit breathed new life into the defense of prosecution laches in Symbol Technologies, Inc. v. Lemelson Medical, Education & Research Foundation, 277 F.3d 1361, 1363 (Fed. Cir. 2002). The defense requires a showing of “unreasonable and unexplained delay” in prosecution and prejudice to the accused infringer. As applied to individual cases, much of the burden of interpreting whether a delay is “unreasonable and unexplained,” or the extent to which a defendant is harmed by such a delay, is left to the discretion of the court. Because of this, tracking recent court decisions on prosecution laches could provide unique insight when asserting or opposing a prosecution laches defense. Docket Navigator not only keeps track of who is issuing orders regarding significant legal issues, but also summarizes each order on those legal issues, making it easy for you to both find the documents pertinent to your situation, and sift through them for valuable information. To view the latest district court rulings on prosecution laches check out this video. Under what circumstances have district courts granted permanent injunctions in the past year? There are several ways to search for orders in Docket Navigator's database, but the most commonly used method is by a type of motion. However, in addition to searching by type of motion, Docket Navigator allows you to search by the legal concepts addressed in court orders. This allows you to customize your search to find exactly what you are looking for. For example, if you are looking for the total number of motions granted versus motions denied, you might search for a type of motion, i.e. “type of motion: motion for permanent injunction.” This search would yield all orders on motions for a permanent injunction, even orders where the court provided no explanation for its ruling. On the other hand, if you were more interested in courts’ rationale — i.e., how they have applied Supreme Court or appellate decisions – you would want to search by legal issue, i.e., “legal issue: permanent injunction.” This search would yield all orders addressing the legal concept, regardless of whether that concept was addressed in an order on a motion for permanent injunction or some other type of motion (e.g., a motion to stay injunction pending appeal, etc.). This type of search is particularly useful when a legal concept can be addressed in many different types of motions. For example, substantive infringement, validity and enforceability issues can be raised in motions for judgment on the pleadings, summary judgment motions, motions for judgment as a matter of law, motions for new trial, etc. Likewise, challenges to the pleadings may be raised in motions to dismiss, motions to strike, motions for more definite statement, etc. By selectively applying type of motion filters and legal issue filters you can ensure that your search results deliver exactly the information you need. See what filters we applied to answer today’s Question of the Day. The court granted defendant's motion for summary judgment of noninfringement of plaintiff's cell separation patent and rejected plaintiff's newly-adopted claim construction. "[T]hroughout this protracted litigation, both parties have consistently identified the 'plurality of tubes' as the umbilicus. . . . [T]he doctrine of judicial estoppel prevents [plaintiff] from now asserting a different construction of 'plurality of tubes.'" Thanks to everyone who submitted a correct answer for our Scavenger Hunt this week. More than 30 attorneys found the correct answer with the powerful Docket Navigator patent litigation research database. Congratulations to Wallace Lee of Latham & Watkins for winning the iPad2®. We will be hosting another Scavenger Hunt next Wednesday, September 21, 2011 so be sure to ask for a free password to Docket Navigator so you'll be ready to search! Plaintiff Ordered to Reduce Asserted Claims From "Between 88 to 121 Claims" to "31 Claims Across the Four Patents-in-suit"
Defendants' motion to limit the number of claims was granted and plaintiff was ordered to reduce its claims from 88-121 against each defendant to 31 claims across the four patents-in-suit. "The Court finds that limiting the amount of claims asserted by Plaintiff is appropriate at this time to aid in efficiency and narrowing the claims prior to claim construction. . . . Plaintiff may move the Court to add additional claims that present a distinct issue of infringement or invalidity, upon a showing of good cause." Announcing the Docket Navigator Scavenger Hunt! For the past few weeks we’ve been publishing a “Question of the Day” -- a question that is likely to arise in patent litigation, along with instructions on how to answer the question using the Docket Navigator database. Starting today, and continuing each Wednesday in September, we’re hosting a scavenger hunt. Here’s how it works. We’ll ask a Question of the Day, but instead of providing an answer, you get to find the answer using the Docket Navigator database. Correct answers can be submitted to win a guaranteed prize (2GB USB flash drive) and a chance to win an even bigger prize (an iPad2®)! Here's the catch: if you are going to participate in the scavenger hunt you have to play quickly. The deadline for submitting correct answers ends tonight at midnight central time. The iPad2® drawing* will be held tomorrow. It's a quick contest. So take the challenge and see if you can answer the Question of the Day. It only takes a few minutes. You’ll learn how to use a terrific resource and win some great prizes along the way! Permanent Injunction Against "Deriving Future Revenue" For Maintenance Services for Infringing Products is "Entirely Proper"
In granting plaintiffs' motion for a permanent injunction, the court found that defendants would have to remove or disable software sold pre-verdict when defendants collected a maintenance fee. "[Plaintiff] contends that [defendants'] ongoing revenue stream from maintenance associated with the infringing products constitutes products. That is, [plaintiff] argues that until [defendant] removes the infringing capabilities from a given customer's software, such revenue is associated with future infringing activity that should be enjoined. The Court agrees and finds that enjoining [defendants] from deriving future revenue from unmodified, infringing products is entirely proper." What is Judge Crabb’s track record in patent litigation? District courts have a great deal of discretion in patent cases. Procedural rules, scheduling issues, fact and expert discovery, disclosure requirements, evidentiary matters, and many substantive rulings are all determined by a judge. And many of those rulings are effectively unreviewable. Obviously, the more you know about your judge the better you can advise and advocate for your client. - Denied 5 motions for enhanced damages or attorneys’ fees and granted only 1. To see how we located the Judge Summary Page for Judge Crabb, watch today’s video. The court denied in part plaintiff's motion to strike the second supplemental report of defendant's damages expert even though the expert relied on "a 50% profit sharing rule" that plaintiff argued was "not based on an authoritative source." "[T]he record demonstrates that [defendant's expert] based her opinion regarding the general expectation for a company during a negotiation upon her 'review of thousands of agreements over the 33 years of [her] career.' The court concludes that [the expert's] experience in reviewing comparable agreements is sufficient to establish the reliability of her methodology." The court granted defendant's motion to strike the supplemental report of plaintiff's invalidity expert which included a new prior art reference. "[P]laintiff says that the reference was 'not readily available,' but it does not suggest that its failure to discover the reference earlier is defendant’s fault. In any event, plaintiff does not identify any particular reason why it could not have found the reference in time to include in its main report. 'We had to look hard' is not an adequate justification for advancing an untimely new opinion." Extreme Networks, Inc. v. Enterasys Networks, Inc., 3-07-cv-00229 (WIWD September 7, 2011, Order) (Crabb, J.). What is the litigation history of U.S. Patent No. X? Like its prosecution history, a patent’s litigation history can have significant impact on current enforcement efforts. But quickly and accurately gathering litigation history about a patent (or more so for a group of patents) can be a nearly impossible task. That’s why Docket Navigator created Patent Summary Pages. A Patent Summary Page is where all of the pertinent information about a patent’s litigation history — past cases, past claims constructions, past determinations about infringement, validity or enforceability, past remedies, etc.– appears in a single location that can be accessed in just a few seconds. - In the past two years the patent has been asserted in four cases, two alleging infringement and two seeking declaratory relief. - Fourteen separate claims terms have been construed in past litigation. - A fifteenth claim term – ”filter inductor directly connected to plural of the windings of the at least one transformer” — has been deemed indefinite rendering all claims containing that element invalid. - A jury has determined that the patent was infringed and that the patent was not invalid. - A court has entered multi-million dollar damages awards and over a dozen injunctions due to infringement of the patent. Today’s short video shows you how to access the Patent Summary Page for any litigated patent. Plaintiff's motion for sanctions against defendant for failing to timely produce all of its source code and for violating a protective order was granted in part. "Instead of complying with the Court’s order, [defendant] decided to pick and choose which versions of its code to produce, and to make an arbitrary cut-off as to which of its code it deemed relevant for [plaintiff's] case. [Defendant] did so at its peril because it was specifically warned not to do so." In granting in part plaintiff's motion for sanctions, the court found that the proposed "blended billing rate of $630 -- the average billing rate of the . . . time keepers on this matter" was reasonable. Will the term “patent troll” really be allowed in court? That may be true in the context of striking a pleading, but is it true overall? How about at trial? These are the types of questions Docket Navigator was designed to answer. How have judges ruled on specific types of motions, based on specific types of arguments and evidence? Are certain arguments or positions more likely to succeed at one point in the litigation than another? Making the right call can save your client’s resources and result in success on the merits. The wrong call can lead to the opposite consequences. Here’s how Docket Navigator can help. Check out this video to see how we did the search. - References to “three undisclosed items” that had previously been deemed insufficient to support an inequitable conduct claim. From these rulings we can conclude that FRCP 12(f) sets a very high bar for striking pleadings or portions of pleadings. In fact, one might conclude that the only material egregious enough to clear the bar would also prompt a sua sponte order. At least that has been the track record so far. Second, we changed our search criteria to focus on motions in limine instead of motions to strike. Specifically, we searched Docket Navigator for (i) orders on motions in limine directed to statements by counsel, where (ii) the order contains the term “troll.” Once again, we received seven results. But this time, the motions were uniformly granted. Indeed, in six of the seven motions, the parties stipulated that the term could not be used at trial. We did not discover a single case where a court deemed it proper to use the term “patent troll” at trial. The message here seems clear: context is everything. Challenging the use of “patent troll” and other potentially derogatory terms at the pleading stage has nearly always failed. But challenging those same statements in a motion in limine has uniformly succeeded. So, while the term might stay part of the pleadings it is unlikely to be used at trial. The court denied defendant's motion to strike the phrase, "patent troll" from plaintiff's pleadings despite defendant's argument that "'[d]escribing the opposing party as a 'troll' – an ugly, mythical cave-dwelling being – is not in keeping with the dignity of the Court, and has no relationship to the causes of action raised in the Complaint.'. . . Plaintiff argues that it merely used the term 'patent troll' because it is relevant to Plaintiff's contention that Defendant has alleged infringement in bad faith, which could be grounds for Rule 11 sanctions and attorney fees. Because 'patent troll' is a term commonly used and understood in patent litigation and is not so pejorative as to make its use improper, the Court denies Defendant's Motion." Have Google’s spam filtering tools ever been accused of infringing a patent? Yes. Google’s spam filtering tools have been accused of infringing a patent in at least two different lawsuits. Today’s question provides a great example of how Docket Navigator may be used to search for cases that involve particular parties and accused products or services. Check out today’s video to see how we did the search. Have any patents in the insurance industry been challenged as claiming unpatentable subject matter under Bilski? Supreme Court and Federal Circuit opinions often leave open questions about how changes in case law will play out in other cases. And since the appellate process can take years to complete, often times the district courts provide the only source of clarification or application of new case law. Knowing how district courts have ruled on developing legal issues in the context of particular industries or types of technology can provide significant advantages to those litigating claims involving those industries or technologies. Using Docket Navigator, we can quickly ascertain whether any patents in the insurance industry have been challenged under Bilski. To see how, watch this short video. See the original article and full list of patents here. Defendant's motion to dismiss plaintiff's infringement action for failure to state a claim was granted. "[Plaintiff's allegation of direct infringement] contains nothing more than a '[t]hreadbare recital of the elements of' direct patent infringement. The Court need not accept these as true. Once these conclusory recitals are removed from consideration, the complaint is devoid of any factual allegation to support a plausible claim for relief. Plaintiff fails to include any facts identifying what aspect of the [accused system] infringes its patents. Merely naming a product and providing a conclusory statement that it infringes a patent is insufficient to meet the 'plausibility' standard set forth in [Bell Atlantic v. Twombly, 550 U.S. 544 (2007)] and [Ashcroft v. Iqbal, 129 S.Ct. 1937 (2009)]." Can I object to the production of my client’s source code on the basis of relevance or confidentiality? Where the source code is relevant to the patent issues, and a timely and proper request has been made, defendants are uniformly ordered to produce source code. In fact, we discovered only one instance where the court denied a motion to compel defendant’s source code. But that case also involved a number of procedural missteps and even there the court allowed a renewed motion if plaintiff’s review of other discovery responses proved inadequate. Courts typically address confidentiality concerns by entering a protective order limiting the people who have access to the source code. Other protections include: requiring production to a third party or requiring production at defendants’ headquarters. In some cases courts have been open to production of a portion of the source code, subject to expansion upon a showing of need by plaintiff. Where source code production involves additional costs, there is no discernible trend as to which party bears the additional cost. In some cases the cost was allocated to defendant, in others to plaintiff, and others it was shared. In one instance, a creative defendant sought production of plaintiff’s source code on the basis that it was relevant to enablement, inventorship, and obviousness issues. The court disagreed and denied the motion. View our search results in Docket Navigator. The court denied without prejudice defendant's emergency motion to compel plaintiff to produce license agreements. "[Defendant's] very sketchy motion to compel fails to persuade this Court, even under the liberal standard of Rule 26, that it should order [plaintiff] to produce documents relating to other [of its] owned patents subject to the vague limitation to 'comparable patents in the industry.'. . . If . . . [plaintiff] has produced actual license agreements, negotiated at arms- length, regarding the patents-in-suit, then that is the best evidence on which to establish a reasonable royalty rate. To the extent that [plaintiff] has not already disclosed all license agreements for the patents-in-suit, then it should do so. [Defendant] has not shown, however, that license agreements involving other patents are sufficiently relevant to be discoverable." Has any court construed the claim term “frustoconical”? The term “frustoconical” has been construed six times in five different cases. It has been construed three times as a stand-alone term and three times as part of a phrase. Constructions vary in their wording, but generally describe a cone with the tip removed (e.g., ”having the shape of a cone with the narrow end, or tip, removed”) or apply the ordinary meaning. Related terms that have also been construed include: “frusto conical”, “frusto-conical”, “frustoconical(ly)”, and ”frustum”. Docket Navigator contains over 35,000 claim terms, sorted by the case they appeared in, the judge who construed them, and the patent they appear in. You can use Docket Navigator to search for claim terms right now. View the short (1:41) video.